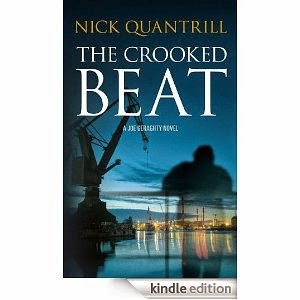 This month down Brit Grit Alley, I take a look at Nick Quantrill's Joe Geraghty novels. This is a cracking book. It's the story of a man- Joe Geraghty- and a city - Hull- that have taken many a good kicking and are trying to get back on their feet. Realistic and romantic - in a Strummer way - it takes you by the lapels and drags you along from the beginning to the end. It's the story of a P. I. following a muddy and bloodstained trail through a battle scarred Northern city. In the Late Greats, Joe Geraghty is hired by an overbearing musical 'entrepreneur', Kent Major, to babysit his possible cash cow - the band New Holland. Once upon a time, New Holland were the bee's knees, the cat's whiskers. Imagine, if you will, Hull's version of Oasis, surfing the crest of the Britpop wave and then, in the blink of an eye,stagnating and self- destructing. But now they're back together having, apparently, forgotten their creative and personal differences and are about to embark on a lucrative comeback tour. So, with his eye on the prize, Kent Major hires Geraghty to keep an eye on the boys, so that all runs smoothly. But, of course, it doesn't and all quickly goes pear shaped when the singer , Greg Tasker, disappears. And, inevitably,Geraghty is despatched to find him. The Late Greats is a fast paced, page-turner, the weight of which rests heavily on Geraghty's broad shoulders. Geraghty, unlike many of crime fiction's messed up PIs, is an Everyman - a decent and likeable bloke just trying to get on with his life after the death of his wife. Trying to adapt to change. Something many of the characters in The Late Greats are trying to avoid. In Quantrill's Broken Dreams, Joe Geraghty's investigations allowed him to to dig into the city's past and address its changes- both good and bad. In this follow up novel, however, Geraghty is forced to look at how people change. How some people grow up,and not always for the better, and others never do. All books are published by Caffeine Night Publishing.